A first-of-its-kind survey shows just how much the region's glaciers have melted over the past decades as the climate warms. It also shows how changes in atmospheric patterns may have masked how bad it could get. 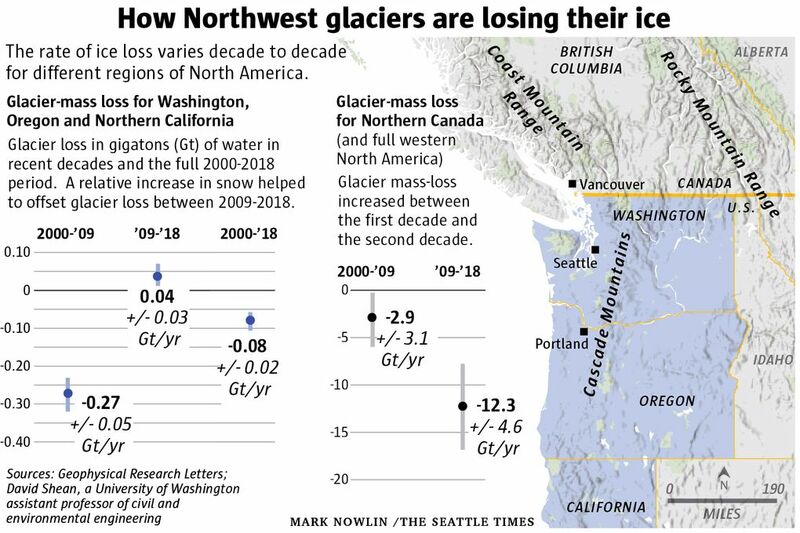 Glaciers in western North America over the past 18 years have lost some 117 gigatons of ice — enough that if it was melted and spread across the state of Washington it would come up our knees, said David Shean, co-author of a recent study cataloging glacial loss. Glaciers are flowing rivers of ice that survive summer’s heat, feed mountain streams with nearly ice-cold water for salmon, provide drinking water downstream and twirl hydropower turbines, generating electricity in the Northwest and elsewhere. Understanding how glaciers are shrinking and the speed of that process could help predict local effects of climate change, and how these masses of ice are interacting with a warming world. 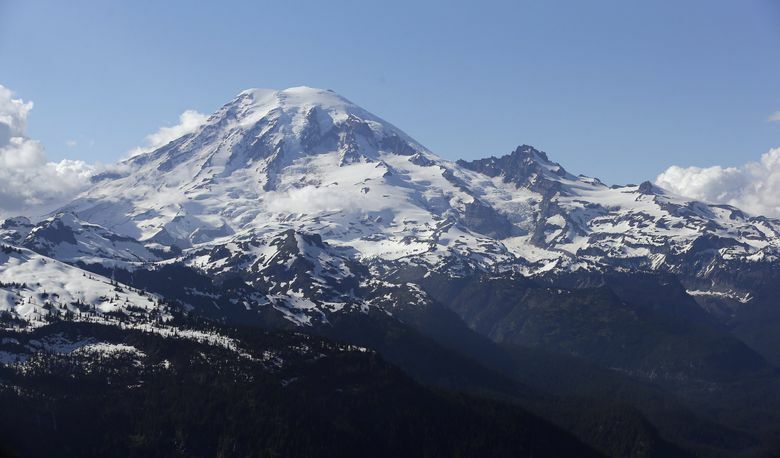 This study, and others, suggest the melting of Northwest glaciers could intensify, as long-term weather patterns shift. During the 18-year period of study, the glaciers that Shean and other scientists examined were responsible for nearly one-third of a millimeter of global sea-level rise, according to the paper, which was published in Geophysical Research Letters earlier this month. Shean’s team used new satellite imaging data and technology to measure the surface elevations of almost every glacier in western North America, excluding those in Alaska. This kind of comprehensive inventory has never been done for the region before, Shean said. Satellites took photos of glaciers from two different angles, he said. Software analyzed and combined those photos to create high-resolution topographic maps of each glacier. For many of the glaciers, scientists ended up with dozens of image sets. Some of the satellite photos were precise enough to visualize individual crevasses, Shean said, with each pixel representing a square foot of ice. After all the data was collected, the scientists used a supercomputer to analyze changes to glacial mass over nearly two decades. Warming temperatures have been shrinking glaciers in North America for several lifetimes. But this new data reveals the importance of variability in long-term patterns in the atmosphere during that process. Almost every glacial region lost ice over the 18-year research period, according to the study, yet the scientists found that yearslong patterns of heavy moisture and storms can stave off glacial loss or even restore glacial ice and raise its surface height. It all depends on winds blowing from the Pacific Ocean, the same atmospheric forces “pushing these low-pressure systems, these storms, that dump huge amounts of rain on Seattle” and into the Cascade Mountains, Shean said. The research paper calls these high-elevation wind events “decadal scale changes in atmospheric circulation.” Shean compares them to a fire hose, launching moisture from the Pacific Ocean, that either aims toward the Pacific Northwest or further north in Canada. For glaciers, when it’s cold enough, these precipitation systems supply replenishing snowfall. The paper split its 18 years of data into two periods: One from 2000-2009, and another 2009-2018. In general, when that stormy flow came in their direction, glaciers better maintained or — rarely — even grew their mass. “For one decade you get the fire hose pointed at Mount Rainier and you get a lot of precipitation. And then another decade, when it’s pointed north, you get substantial losses,” Shean said. During the early period of study, Cascade glaciers shrank substantially. Over the next nine years, heavy precipitation helped places like Mount Rainier interrupt glacial loss and in some areas make nominal gains. In a separate study, another group of scientists, including a UW researcher, examined the phenomenon of natural variability on snowpack. They used 35 years of data from the SNOTEL network, made up of hundreds of automated snow-measurement stations high in the mountains. 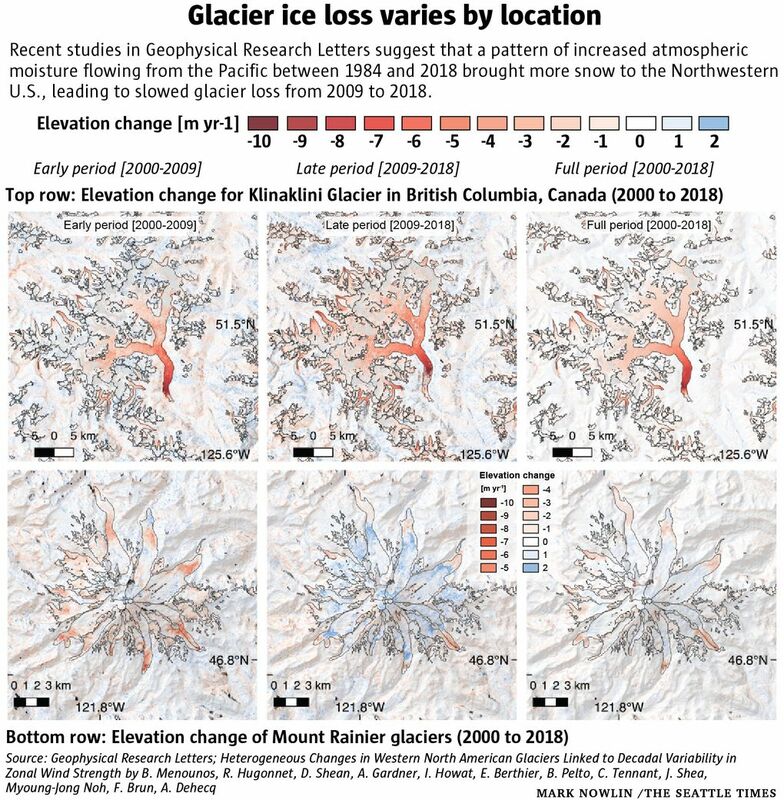 That study, published recently in Geophysical Research Letters, suggests that a pattern of increasing moisture flowing from the Pacific between 1984 and 2018 has largely masked the effects of climate change on snowpack in the Pacific Northwest. In other words, the fire hose has been aimed at the Pacific Northwest more often than expected in recent years. At some point, the researchers predict the long spell of moist offshore flow will subside or even reverse. As temperatures warm, a long pattern of drier weather could lead to shallower snowpacks and increasing glacial melt, which could impact Northwest water supplies, threaten more fish and affect hydropower generation. The two research papers, by separate groups of scientists analyzing different climate signals and using unrelated data — including measurements from both space and from on the ground — came to largely the same conclusion. Shean, who reviewed the research of Siler and others, said both research groups observed the same phenomenon of variability. What happens next could reconfigure Northwest mountains.